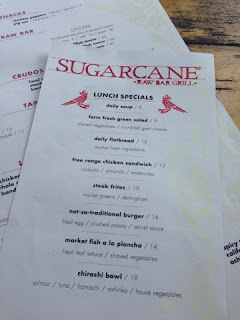 Once a month my team and I venture out for lunch to one of the local restaurants, and the highlight of this week was SUGARCANE. It was everything and more than I expected. Since it’s an absolute paradise in South Florida right now we opted to sit outside and it was simply enchanting – rustic tables, metal chairs, twinkling lights, green lemon trees…you get the picture. Sugarcane definitely has a reputation for a happening scene in Midtown, but if you are not into that, lunchtime is perfect time for a visit to enjoy incredible food and top notch service. And you still get the feel of that cool and vibrant ambience. And the people watching is marvelous. 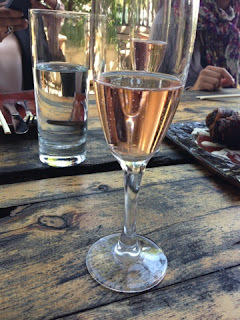 Since there were five of us in my group, we decided to start with a bottle of sparkling Rose, and a few appetizers and crudos…. 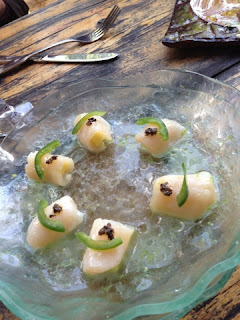 Scallop crudos – apple, black truffle, lime and jalapeño – so refreshing and light. 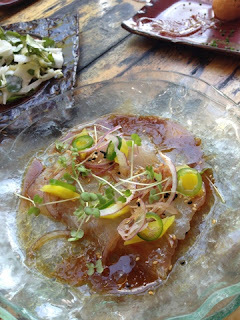 We also had the tuna crudo, which was my favorite, but I didn’t get to take any pictures – we liked it so much, we inhaled it. 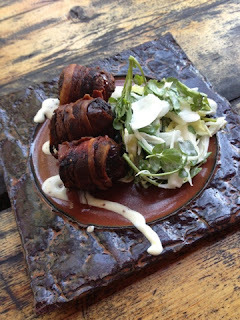 Probably the most famous appetizer and by far the best – bacon wrapped dates with manchego cheese and linguica (smoked cured pork sausage seasoned with garlic and paprika). 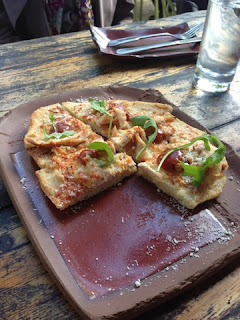 It was just the right balance of sweet and savory with a subtle cheesy flavor. Besides, we all know, bacon makes everything better. We also had roasted brussels sprouts with oranges and sweet soy sauce, which were to die for!!!! We fought over these little sweet and delicious bites. I could have eaten the whole bowl all by myself, that delicious. And as if we didn’t have enough food already, three of us ordered the same entree – the “not so traditional” burger with fried egg, crushed potatoes and the “secret sauce”. When they brought it out, I was shocked…this was a no joke burger…this was the real deal…enough to be shared among three of us and not one for each. 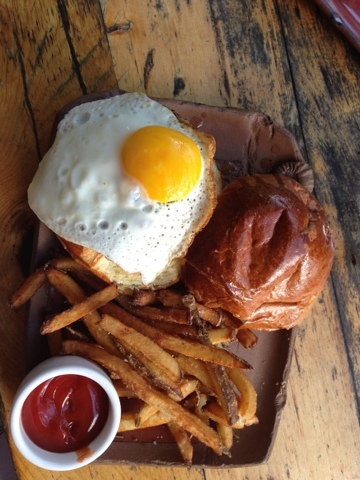 The bun was a brioche bread, lightly toasted yet soft on the inside, with a buttery top, but the winner was the fried egg – absolutely orgasmic. From start to finish this meal was mouthgasmic….yup, I just went there. Flavors, textures, attention to detail, service, it all makes it a wonderful wednesday afternoon lunch experience. 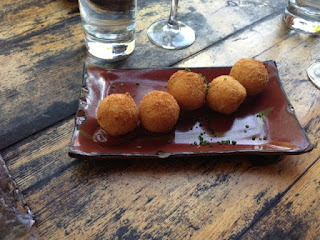 It’s well known on this blog that I am not a fan of sharing, but this restaurant is all about sharing and experiencing small bites of perfection. It’s definitely a place where you can indulge in variety of cocktails (I hear sparkling cocktails are amazing) and unique foods.